Something else happened today that has the web buzzing, but we like a wine buzz much more. (Pretty nice looking tablet, but I’m just not sure how “necessary” it is–and I already pay for internet at home, and a lot for my iPhone data plan, I don’t really want another monthly internet bill. We’ll see). 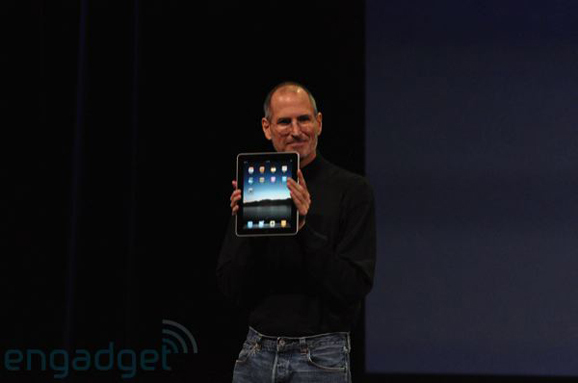 Photo from the totally geeky, but entertaining, liveblog of the event at Engadget. 1. Where is wine going in the next decade? : Other than in my mouth, I’m not sure. But Harmon Skurnik might know. 2. Shameless self-promotion #1: 10 of the top wine blogs. We are in pretty good company, and please don’t hesitate to have us over for dinner–as long as your parents are away. 3. Shameless self-promotion #2: The 9 best new food & drink blogs of 2009. Thanks guys, drinks are on us. 4. Trick or Tweet: There are a lot of things I hate about Twitter. Drink Nectar illustrates how you guys can make me hate it less. 5. Bourboulenc + Verdelho = Bourdelho: Goes great with crabs. 6. Do you know the importance of a Skypager? : Totally unrelated to wine, but a list I love. My friend and best-producer-in-the-history-of-hip-hop, Dante Ross lists some forgotten hip-hop accessories. Thanks for the mention in your list. Hopefully we can poke some of the Facebook Tweeters and get them to realize the annoyance of their ways. Also – great recognition in Imbibe Mag! Whoo! Ha…I am with you on number one…guess I will take notes from Harmon Skurnik.